Once again, our family was out xc skiing on the weekend and encountered several people hiking on groomed, track-set ski trails in Banff. If you read my last blog post, Choosing to ski, you'll know that we personally prefer skiing to snowshoeing or winter hiking. I like to explore the uniqueness of each season and I can hike the other three seasons of the year. Therefore, we devote the fourth season to skiing. Our preferences aside though, I think there is great value in winter hiking, and snowshoeing is a fabulous sport for those that enjoy exploring at a slower pace. However, I'm starting to think that many tourists and locals alike just don't know where to go in the mountains for great winter hiking. There are so many wonderful trails and many of them are not only easy, but they are also family-friendly and pose little to no avalanche risk. It's very easy on the budget for a whole family to get into snowshoeing. You can easily buy snowshoes second hand and you likely won't need lessons. There are no lift or trail fees. The only additional cost you'll need in addition to your snowshoes is gas. If you choose trails that are well packed down you won't even need snowshoes. You also don't need to buy a pricey ski sled or Chariot to pull young children. Child carriers that you likely already use for hiking will work in the winter as well. The challenge will be keeping small hands and feet warm while dangling in a pack. 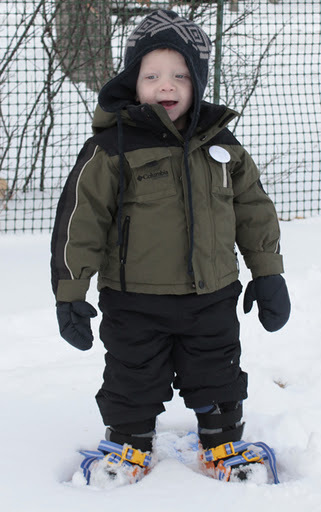 I am no expert on winter hiking with an infant or small toddler but check out the other blogs on my blog roll if you want to know what other baby wearing moms and dads are using. If you are one of those baby wearing parents, please leave a comment on this blog with your recommendations. 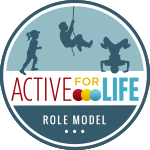 As mentioned above, you don't need to invest in lessons and kids as young as 2 or 3 can learn to snowshoe or at least hike on hard packed trails. Snowshoeing season starts late November and goes all the way into April. Sometimes you can still ski in April but the trails aren't very good by then. We often don't even start snowshoeing in fact until April when we've had our fill of skiing and want to get a head start on spring hiking. Many trails are so hard packed in April that you won't need snowshoes either. Cleats or yak trax suffice in most places. 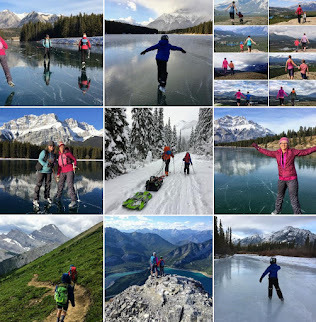 Most of the photos featured in this story were either taken early or late season when it's warmer out and very pleasant snowshoe weather with small kids. Finally, there are some places that just aren't accessible on skis. Narrow trails, tight trees and sharp corners are not something a skier looks for on their outings. Many beautiful places are best accessed on snowshoes. (why we have both skis and snowshoes) If you are a novice skier or prefer groomed track-set trails, you'll also prefer snowshoeing in to many places that would be considered a ski touring destination. The majority of xc skiers prefer to stick to the official ski trails and leave the natural trails to snowshoers. I'll break the Rockies down by area below with my picks for best winter hikes and snowshoe trips. I'm also going to quickly explain the difference between winter hiking and snowshoeing so that you can choose the trail that is best for your family. Hiking trails are those that will most likely be packed down and that you should be able to do without snowshoes. Cleats or yak trax might be necessary in icy conditions but snowshoes would normally be overkill for these popular hard packed trails. These trails are awesome for young children that can't wade through deep snow yet and need a more solid surface. Snowshoe trails are those that have enough snow to warrant bringing your snowshoes. Without the snowshoes you would be sinking, post-holing, and wading through deep snow drifts. If you aren't interested in trail breaking, choose trails that are labeled as official snowshoe trails. These trails are so popular that you can often hike them in just your winter boots. You certainly won't be expending much effort wading through the snow because the trail will be well packed down. Again, these trails are good for small kids who need a firmer surface. This area usually doesn't have enough snow to warrant snowshoe use. Great for hiking. This area usually doesn't have enough snow to warrant snowshoe use. 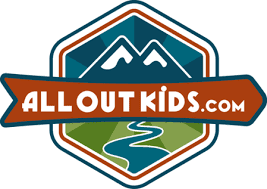 Great for hiking and awesome for families. The Village has a skating rink, hockey rink, toboggan hill, cafe and restaurants. Great snowshoe trails and you can now stay off the ski trails because as you see, there are lots of other options! These trails don't see enough snow for snowshoeing but make for great winter hikes. The trails in the town of Banff don't get enough snow for snowshoeing but are great for winter hiking and close to the amenities of town. Trails on the Norquay Road or Lake Minewanka Road will probably have enough snow for snowshoeing. Snowshoes are usually necessary for all trails in this area unless it's late Spring and you are hiking around Lake Louise on hard packed snow. Great snowshoe trails can be found in this park. More great snowshoe trails can be found in this park. Thanks for all the information! 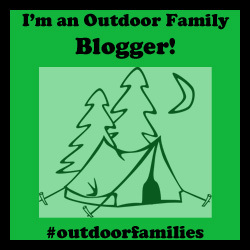 Since our 2 1/2 year old son wants to be an active participant in our adventures we're always looking for things we can hike/snowshoe as a family. Hi, we are looking to buy snowshoes for our daughter to winter hike on the East Coast. 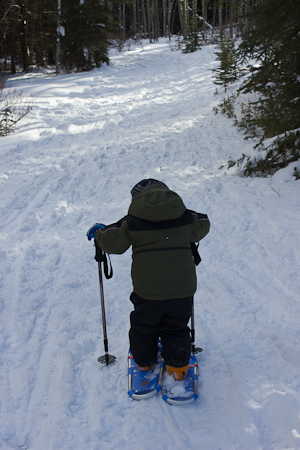 What kind of snowshoes did you end up getting for your son? Thanks! We have the kids' Atlas snowshoes. We got ours used but Mountain Equipment COOP sells them.